Still running behind and hit my first hiccup. I think that I’ve tried to highlight up too quickly. By that I mean that I’ve gone stright from the Codex Grey base coat (which is dark as it’s layered on top of Adeptus Battlegrey) to Fortress Grey. The end result is a pretty poorly blended highlight. Sadly as I painted this with an airbrush it’s too late and complicated to repaint that area from scratch 🙁 I’ve blended in a bit with some neat Codex and it’s helped, but it’s not at the level of painting I’d hoped to achieve. I also think that I’ve had too big-a-break from painting and have lost some of the brush control that I’d developed. Quite gutting to be honest, but I’m just going to plough on. I have booked Friday off as holiday so have a little bit of extra time. The highlighting and shading were more time consuming as I really didn’t get into it properly – I find that when I have a bit of a ‘not happy with it’ moment, that I loose steam. So when I get back tonight, my job is to finish the highlighting and shading (a tall order and late night might be involved). Tomorrow is out as I have to go out, but Friday should allow me a good chunk of painting time. Fingers cross that it’s enough! I’ll add a progress shot up tonight, but yesterday I actually did get paint onto the main Dreadnought assembly of my Golden Demon entry. I’m getting the hang of the airbrush as well, which should make things much easier in the long run. I begun to shade and re-undercoat the various bit last night as well, though my eyes were starting to go fuzzy so sadly had to stop – mind you not that surprising as I’d been airbrushing in the garage, where the light isn’t that fantastic. My deadline is still very tight (verging on the impossible), as the base needs to be painted and the cloak finished, both of which could feasibly be classed as a model in their own right. Sadly I’m out tomorrow evening at a friends (though am planning on coming home early) and out for a few beers on Thursday and I can’t get out of either – not enough time left!!! 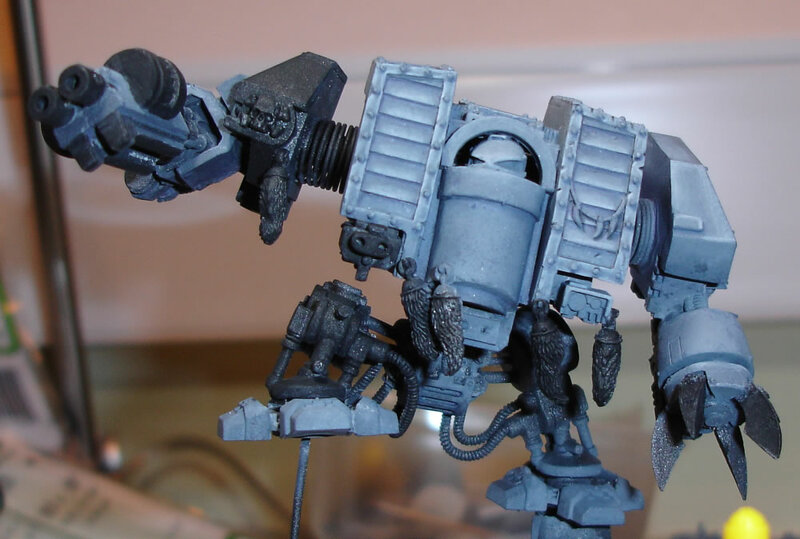 I have two items that I aim to get done tonight – shading and highlighting of the Dreadnought. I’m going for a pretty simple scheme here, shaded with carefully applied washes (three or four colours), plus lined with a codex grey and charadon granite mix (this looks like lightly weathered dirt). Highlighting will be fortress grey on a wet pallette (which keeps it moist for longer and help to prevent chalking up) and sharp edge highlights with skull white. Once that is done I have to finish re-undercoating the metal areas, which roughly break into two items – steel and bronze, then paint these up. Thankfully metallics are not horrifically complex to paint. I can then park the body on one side and work on the cloak. Currently I’m meant to be working on my brothers flat again on Saturday – however I’m toying with the idea of taking another one of my precious days holiday and using this to stand a chance at getting everything painted. It’s daft just how quickly you progress when you get a decent block of uninterrupted time. I’ve just spent an hour and a half (or so) on both arms and they’re almost completed now. I’m probably not going to add any extra armour plates on due to time restrictions, but the gun arm looks pretty much exactly what I was after. Given more time I’d have actually crafted a proper gun block, but this looks more than acceptable. Some more wolf pelts needed on the arms however. I have putty drying on the gun arm at the moment, so that’s now out of development for a few hours until that’s solid. I started off yesterday evening with the best intentions. I cleared an area to work in, got my rivet maker out, lit a candle for the heat and got a load of sprues ready. All I can say is that if anybody can get a Greif Rivet maker to consistantly make uniform sized rivets, please tell me how the hell you do it. I spent over an hour and a half faffing around and managed to make around twenty ‘OK’ rivets. So I decided to revert back to Plan A and use 0.79mm ball bearings instead. 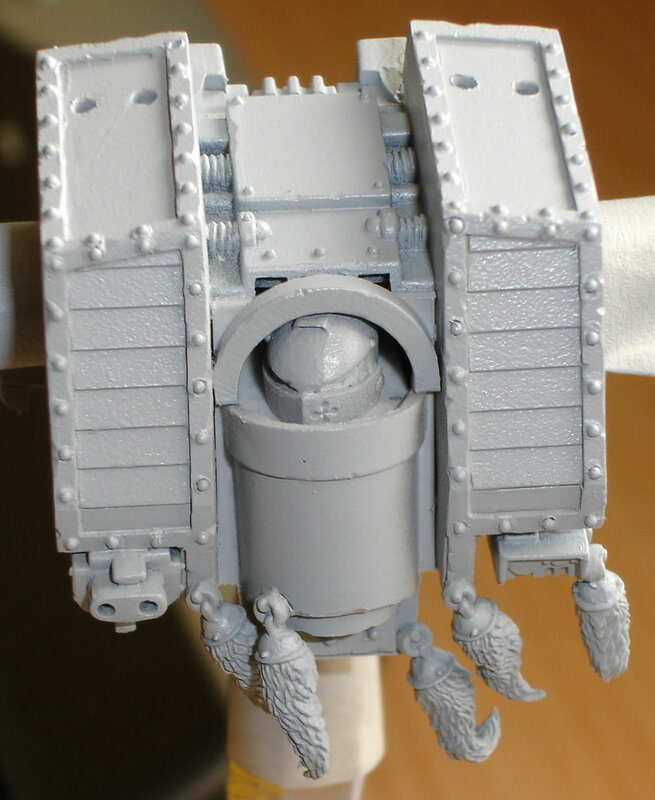 Though more fiddly and more difficult to manouver due to being glued in place with super glue, the end result is at least more uniform than different sized plastic rivets. 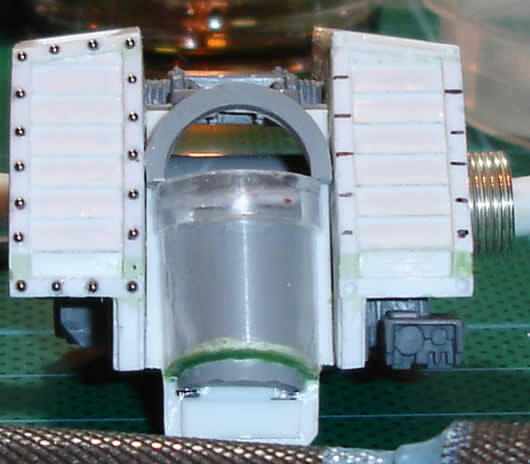 As you can see from the image I’ve got the front of one side done. The photo picked up a number of glue spots and one or two ball bearings that need popping out and re-positioning. Before I hit the sack I managed to drill all of the marked positions on the other side, which went more quickly than the first ones. With hindsight (the most wonderful of things), I should have worked out the positioning on the computer and printed off a ‘ruler’ for each strip of rivets. This would have resulted in a better distribution of rivets along the length of the edging – that said, providing it looks OK, I’m beyond the point of caring. I also got two loops cut and drilled that will allow me to ‘fix’ the cloak on, this biggest annoyance is that the holes need a bit of filling after the loops are glued in – which is going to complicate the fact that I wanted the cloak as a separate assembly. What is it they say “The best laid plans…”. It has transpired that we have some kind of blockage in the waste pipe at home, which resulted in a pretty substantial flood from our downstairs loo – the water from my sisters shower. This has meant that we’ve currently got the plumber in, dismantling our fairly new downstairs toilet area. We’re struggling to get some of the carpet tiles for my brothers new flat (that I have to fit) which means that I’m having to travel farther afield to get them. Oh and Monday evening got almost completely obliterated with computer jobs. On a plus point, I have Thursday afternoon, Friday and all of Monday off as holiday where I need to seriously crack on with things. Last night I managed to squeeze in a bit of filling of the gun arm. This can be sanded tonight (with luck) and a bit more filling/packing which should result in the shoulder mount for that arm being largely finished. The Chaos Marine has had both feet repositioned and filled (fingers crossed it’ll look OK as I’m not that great at sculpting). In order to stand a chance to getting this project done, I need to be in the position to sculpt the cloak on Thursday afternoon, to allow it to dry overnight – giving me Friday to begin spraying the whole thing. 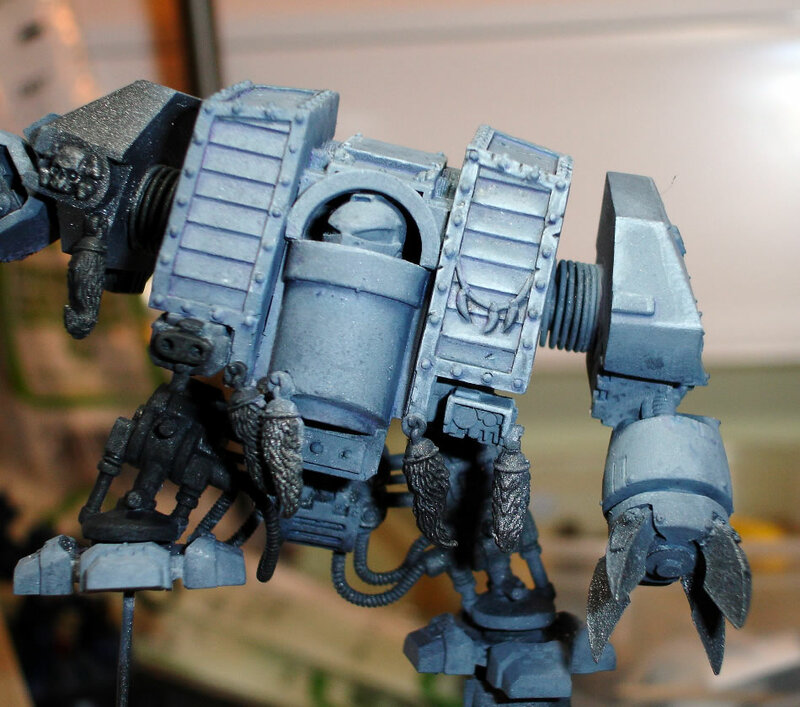 Quite scarily, if I begin with a coat of grey primer, it could be Monday before I actually airbrush anything (ideally 24 hours drying time on the primer). What this does however is to quite dramatically focus my attention on getting the torso finished. So it’ll be a matter of adding the stud rivets around the edging tonight or tomorrow and drilling the holes for the wire that will hold the fur/cloak in place. I also need to make a decision on the exhausts and power plant. Now if things actually do go to plan (unlikely to be honest), I could potentially get the cloak shape knocked out in an hour or so. I can then position it near a light in order to cure it more quickly. If I can get it solid in time to prime it on Thursday, I could potentially grasp back half a day – and airbrush on Friday afternoon.